Deep back in the day — when it was harder for black folks to get anywhere near money, much less on it — Edward Kennedy Ellington spoke to us all. 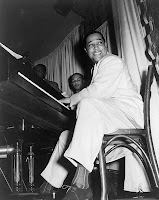 From close to the dawn of jazz and well into an era crowded with uneven yet adventurous experimentations in the form, Duke Ellington set the standard for musicianship, invention and style. With between 3,000 and 5,000 compositions to his credit, some of it among the most indelible and necessary music this or any nation has ever produced, the Duke can claim the United States as his realm, first one crowded with inspiration, later one inhabited by legions of his still adoring fans. Clearly, the Duke’s realm was America. All that realm needed was a coin, and on Tuesday, courtesy of the United States Mint, we got one. For the first time in American history, a coin placed in general circulation will feature the likeness of a single African American: the Duke sits at a piano on the reverse of the new quarters just issued by the Mint. They’ll be available in bulk quantities (bags and rolls) for about another seven weeks or so. The Ellington coin, part of the series documenting moments and figures in history from each of the 50 states, represents the District of Columbia, where he was born in April 1899 and where he lived, in the district’s U Street Corridor, artistic if not literal home to Ella Fitzgerald, Cab Calloway, Billie Holiday and other titans of jazz. In some ways it’s an obvious nod to the clout and presence of Black History Month and, to a lesser extent, the groundbreaker-in-chief now occupying the Oval Office. But credit the Mint for a decision that recognizes the cultural symmetry in play regardless of the date on the calendar. Rather than bearing the likeness of a statesman, writer or politician, or someone whose exploits resonated from the remove of an earlier national era, the first general-circulation coin portraying a solitary African American bears the likeness of a man whose musical influence is very much in general circulation — its style and rhythms and invention foundational to the American songbook, its presence part of the American fabric. Duke won nine Grammy awards in his lifetime of 75 years, four more posthumously, along with any number of other plaudits and honoraries bestowed upon him. Live long enough and you'll get every accolade there is to get. The ingenious triumph of this award from a grateful nation lies in its everyday grandeur, its ordinary ubiquity — the ubiquity of a quarter in your pocket and music in the air. You can buy the new Duke Ellington quarters in counts of 100 for $32, and change. The coins will tarnish long before the music does. Image credits: Duke Elllington, New York City, May 1943, by Gordon Parks. Coin: U.S. Mint. When in the course of human events it becomes necessary to draw a line in the sand and say “no more,” well, we do it. Most of us, anyway. We have our limits, our threshold for taste. And there’s always someone willing to go that extra mile, to venture into the territory of the ridiculous. So we don’t have to. Well, it's happened again. You can’t make this up. Coins and victory plates and action figures are no longer enough. The deification of President Barack Obama has officially entered the realm of the irredeemably inane. From the good folks who brought you Chia Scooby-Doo, please welcome the Ch-Ch-Ch-Chia Obama head, grafting the time-honored Chia Pet principle (water the seed-laced surface for x number of days and watch with wonder as seedlings resemble hair sprout) onto the likeness of the 44th president. The Chia Obama comes in two, uh, guises? Flavors? There’s a Happy Obama and a Determined Obama. The resemblance to President Obama is arguable; to our eyes the Determined Obama isn’t too bad, but Happy looks like Gene Wilder with a bad rug. No word yet on when Sneezy, Grumpy or Sleepy Obama go on sale. Each Obama Chia head comes with a seed packet; a pottery planter for the proper display of the nation’s chief executive; a “convenient drip tray” (A clay head needs a drool bucket? Who knew? ), and an instruction sheet for the proper care and feeding of the presidential homunculus. It’s big fun for the whole family, even after the whole family stops laughing. And it’s instructional; use this and teach your children just how far a celebrity-besotted culture in the midst of severe economic crisis will go to keep itself afloat. You can pre-order these bad boys right here. Orders ship on April 1 — and that fact alone deserves to be some kind of a clue. The Republicans in exile have been an ugly and ill-tempered crew, even before the election of Barack Obama as president, that mismatch most everyday Republicans have since reconciled themselves to: First it was the right wing of the punditburo (Noonan, Krauthammer, Brooks) weighing in, heavily against him. Then Sean Hannity brought forth trash talk and fabrications. 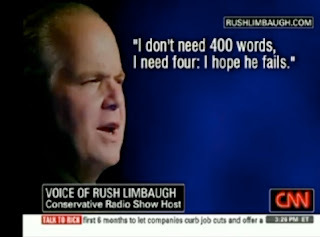 Further along, radio Doberman Rush Limbaugh did away with civility altogether (“I hope he fails!”). Then came the nakedly partisan voting against the president’s stimulus bill. That was all bad enough. But two recent statements from two different Republicans brought home just how strangely, frighteningly desperate the GOP is today — desperate enough to impugn the character and insult the race of the president of the United States. This is Gotterdammerung for dummies, a twilight of the dim bulbs. Live from Orange County, the conservative sliver of Southern California that brought you the John Birch Society, and State Senator John Briggs, father of a failed bid to ban gay and lesbian teachers (Proposition 6) ; where bloggers patly trumpet ADAM AND EVE NOT ADAM AND STEVE in response to just about any issue related to gay and lesbian civil rights … here’s Dean Grose! 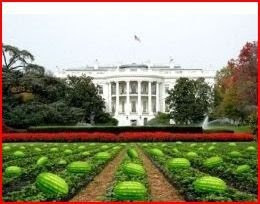 He’s not yet a household name yet, but Grose, the mayor of tiny Los Alamitos, is well on his way to a spot in some idiot hall of fame for an e-mail he sent to a friend from a personal account — a panoramic photo-illustration of the White House with the lawn lined with rows of watermelons, under the title “No Easter egg hunt this year.” Cue the hoop skirts and antebellum banjoes. Keyanus Price, a black local businesswoman and volunteer, said she got the e-mail from Grose's personal account. "I have had plenty of my share of chicken and watermelon and all those kinds of jokes," Price told The Associated Press. "I honestly don't even understand where he was coming from, sending this to me." The Orange County Register first reported the e-mail late Tuesday. Retreating to a breathtakingly brazen display of social ignorance, Grose told the AP said he was unaware of the racial stereotype connecting black people and watermelons. Price is not so sure. “Now I am like, ‘wow, is this really how he feels?’” she said. You’re left to wonder if there’s something — a strain of rampant cell-destroying virus, bacteria in the water — that’s visited the brains of some in the Grand Old Party. With a broad tactic of character assassinations, innuendo and opposition seen as less based on principle than on politics, the GOP has adopted that crouch of utter desperation, a determination to fight off an enemy it sees everywhere, like a cornered animal with nothing left to fight with but its claws and sheer nerve. This is the party of Lincoln today. This is the Republican Party 2009. This is not the way back to the White House. 'Vox Update: Feb. 28: Dean Grose has resigned as mayor of Los Alamitos effective March 2. He has reportedly accepted a position with a watermelon PAC in Washington. It may be the signature visualization of the machinery of American government: amid a backdrop of the flag, the President of the United States, flanked by the Vice President and the Speaker of the House, addresses that body and the American people in a joint session of Congress. The joint session that took place last night was both no different and something else again. With the nation in unprecedented financial turmoil, prosecuting two wars at astronomical expense, President Obama made his first address before Congress. A lot was said by the punditburo beforehand about how the president would need to invest the moment with drama, with theater. They needn’t have bothered; there’s enough theater built in to any joint session of Congress. But Obama seized the power of this special hour with a warning to the banking industry; a demand for that industry to resume lending to everyday people; a catalog of planned initiatives; a preview of his first federal budget, soon to be submitted; and a ringing oratorical profession of his faith in the American people to not only endure but prevail in the worst times most of those American people have ever seen. He set the tone right out of the gate: “I know that for many Americans watching right now, the state of our economy is a concern that rises above all others. And rightly so. If you haven’t been personally affected by this recession, you probably know someone who has – a friend; a neighbor; a member of your family. You don’t need to hear another list of statistics to know that our economy is in crisis, because you live it every day. It’s the worry you wake up with and the source of sleepless nights. It’s the job you thought you’d retire from but now have lost; the business you built your dreams upon that’s now hanging by a thread; the college acceptance letter your child had to put back in the envelope. The impact of this recession is real, and it is everywhere. What followed was an address that combined oratorical styles: by turns a fireside chat, a toughlove expression, a policy statement and a shot across the bow of those forces complicating the national recovery. The whole 55-minute address had many high points; if you want the whole thing, here it is. Otherwise, excepts of what may be the best speech presented by an orator with a track record of stellar speeches will do. ”[W]e will act with the full force of the federal government to ensure that the major banks that Americans depend on have enough confidence and enough money to lend even in more difficult times. And when we learn that a major bank has serious problems, we will hold accountable those responsible, force the necessary adjustments, provide the support to clean up their balance sheets, and assure the continuity of a strong, viable institution that can serve our people and our economy. “I understand that on any given day, Wall Street may be more comforted by an approach that gives banks bailouts with no strings attached, and that holds nobody accountable for their reckless decisions. But such an approach won’t solve the problem. And our goal is to quicken the day when we re-start lending to the American people and American business and end this crisis once and for all. “I intend to hold these banks fully accountable for the assistance they receive, and this time, they will have to clearly demonstrate how taxpayer dollars result in more lending for the American taxpayer. This time, CEOs won’t be able to use taxpayer money to pad their paychecks or buy fancy drapes or disappear on a private jet. Those days are over. ”So often, we have come to view these documents as simply numbers on a page or laundry lists of programs. I see this document differently. I see it as a vision for America – as a blueprint for our future. “My budget does not attempt to solve every problem or address every issue. It reflects the stark reality of what we’ve inherited – a trillion dollar deficit, a financial crisis, and a costly recession. “Given these realities, everyone in this chamber – Democrats and Republicans – will have to sacrifice some worthy priorities for which there are no dollars. And that includes me. “This is a cost that now causes a bankruptcy in America every thirty seconds. By the end of the year, it could cause 1.5 million Americans to lose their homes. In the last eight years, premiums have grown four times faster than wages. And in each of these years, one million more Americans have lost their health insurance. It is one of the major reasons why small businesses close their doors and corporations ship jobs overseas. And it’s one of the largest and fastest-growing parts of our budget. “Given these facts, we can no longer afford to put health care reform on hold. “[W]e know that our schools don’t just need more resources. They need more reform. That is why this budget creates new incentives for teacher performance; pathways for advancement, and rewards for success. We’ll invest in innovative programs that are already helping schools meet high standards and close achievement gaps. And we will expand our commitment to charter schools. On these and other issues the president laid out a kind of road map of principles and ideas before the real road map: his first budget, which will, finally, line by line, lay out the specifics of the long trip back to solvency. If nothing else, the country’s getting comfortable with Obama behind the wheel; early reaction gauged by snapshot online and post-address telephone flash polls found that the American people generally gave the president high marks for both the style and substance of the speech. This was more than making the right noises. Among other things, Obama’s address to a joint session of Congress was a bid to effect a joint venture of Congress, a rethinking of the usual partisan political reflexes — on behalf of the citizens who put them in Congress in the first place. The president used the phrase “Democrats and Republicans” to hammer home the point that politics as usual has failed us, and it persists at the peril of the American economy, and the well-being of the American people. The strict observers of the doings of our government will rightly contradict those who say this was a State of the Union address; that formally happens after a president’s first year in office. But no matter: on his 35th day in office, President Obama delivered a speech with an urgency of timing that was a match for the urgency of the times — a state of the Union address in everything but the name. 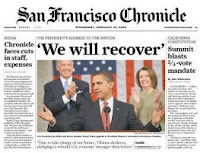 Image credit: San Francisco Chronicle front page: San Francisco Chronicle. Tonight, President Barack Obama makes what may be the defining speech on the defining concern of his first term in office, and he does it with the political wind at his back. The better to prepare himself, and us, for the imperfect storm that lies ahead. The president is the beneficiary of a new year and our natural predisposition for calm right now. The holidays are over, we’ve moved out the last of the bills from the holidays, and we’ve worked off the last of the year-end feasts by shoveling snow. Spring, a season of built-in affirmation, is just around the corner. 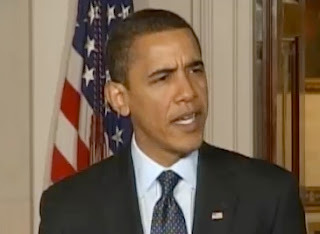 In tonight’s speech before a joint session of Congress, Obama is faced with the need to synthesize -- for a recalcitrant and partisan House and Senate, as well as a hopeful but wounded nation -- the key points of a bold, broad-based and achievable solution to the worst economic crisis since the Great Depression. 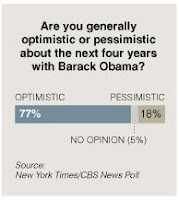 If the NYT/CBS poll results are a reliable barometer, it’s a challenge the American people think he’s up to. And then there's this … this mini-bombshell, a statistical nugget that frees the president from the absolute obligation to affect bipartisanaship — at least as far as a cross-section of the American people are concerned. “Most said Mr. Obama should pursue the priorities he campaigned on, the poll found, rather than seek middle ground with Republicans,” the Times reported. “Most Americans said the president was trying to make good on his promise to bridge the partisan divide. About three-quarters, including 6 in 10 Republicans, said Mr. Obama had been trying to work with Republicans. But only 3 in 10 Americans said Republicans were doing the same. The GOP will try to spin this any number of ways. What it comes down to is, the country’s counting on Barack Obama to stand for something rather than fall for anything, even when the “anything” of bipartisanship looks politically refreshing and may be practically necessary. The poll results couldn’t be clearer in this respect: Obama can’t afford to be so blinded by the prospect of a quasi-coalition government in America that he loses sight of the other coalition to be addressed: the people, and the broad mandate invested in him to be the agent of change. Bipartisanship doesn’t work if the guy across the aisle won’t extend his hand to yours. This is the time to stand on principles, starting with the economic principles the new president will lay out before the American people tonight. The maturation of the membership of the Academy of Motion Picture Arts and Sciences was much in evidence on Sunday night, at the 81st Academy Awards in Hollywood, wrapped in a low-cost, lower-key package of a ceremony that somehow suited the times: flashy but somehow more austere and grounded this year, with dancer, singer, raconteur Hugh Jackman acting as the evening's multitasker in chief — a reflection of the extra hats of responsibility we all wear these days. Oscar wasn't over the top for that long on Sunday. The event itself would have drama enough, the quieter validating drama of the emotional evolution of a famously risk-averse industry. The diversity of the nominees announced previously, and the award winners announced at the Kodak Theater, made it clear: at the age of 81, Oscar’s growing up, rediscovering both the world beyond our shores and that trickier terrain inside our own hearts. For weeks now, the touts and handicappers had been predicting huge things for “Slumdog Millionaire,” the Mumbai rags-to-riches story that captured a staggering 10 Oscar nominations. 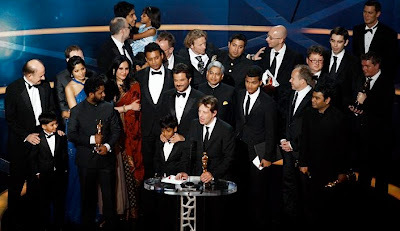 “Slumdog” prevailed mightily on Sunday, fulfilling its own unlikely rise to mass acceptance with 10 Oscar wins, including best picture, best director (Danny Boyle), best adapted screenplay (Simon Beaufoy, from Vikas Swarup’s novel), cinematography, and for original score and original song. Cruz won out over Taraji P. Henson, whose performance as Brad Pitt’s mother in “The Curious Case of Benjamin Button” made her an odds-on favorite; and Viola Davis, who also won high marks for her work in John Patrick Shanley’s “Doubt.” It was the first time that black and minority actresses were in direct competition against each other for an Oscar; that alone made this year’s Oscars a groundbreaking event for diversity demographics. With the “Slumdog” juggernaut, though, Hollywood fully recognized the powerhouse of movies that is modern India. With its singular visual style and compelling storyline, “Slumdog Millionaire” may be a gentle warning to Hollywood to get beyond its shopworn formulas for success —one of those being that Hollywood’s way to tell a story is the only way to tell a story. There, embedded in the images of the usual hetero Hollywood couples kissing, was a shot of Sean Penn and James Franco in their roles in “Milk,” the Gus Van Sant biopic of murdered gay San Francisco Supervisor Harvey Milk — Penn and Franco in a deep liplock right there with the other, iconic images of men and women doing the same thing. Think we’d have seen that at the Oscars 50 years ago? 20 years ago, or even a decade back? The Vegas bookmakers would have loved to take your money. 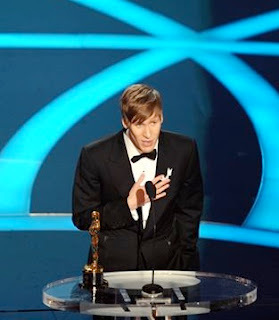 “Milk” got even more love at the ceremony, when Dustin Lance Black, the film’s screenwriter, won the Oscar for best original screenplay and offered in his acceptance speech a truly moving cry of the heart. Penn was no less passionate when he won the Oscar for best actor, his second, for his portrayal of Harvey Milk. There were other Oscar winners: Kate Winslet, knocking on Oscar’s door for years, finally got herself a Golden Dude for her portrayal of a former Nazi concentration camp matron in “The Reader.” And some thirteen months after his death by accidental overdose, Heath Ledger won the best supporting actor award for his riveting star turn as The Joker in “The Dark Knight” — a stunning portrayal that reinvented the role no one thought could be improved on after Jack Nicholson did it in 1989. But the night’s biggest winner was Oscar and the film community he represents. This was America's soft power in evidence. The impact of our popular culture is already the envy of the world; now with a film representing the hopes and possibilities of 1 billion Indians acclaimed as Hollywood's best, the global reach of that culture is even wider, more envied and more beloved. By honestly confronting the power of worlds and lives outside the comfort zone of tradition and custom; by paying tribute to those other views and experiences, Hollywood showed how change — more than a campaign slogan or a good idea — is nothing less than the inescapable constant of all our lives. Image credits: Slumdog ensemble: Gary Hershorn/Reuters. Dustin Lance Black: Gabriel Bouys/AFP-Getty Images. Penelope Cruz: Mark Ralston/AFP-Getty Images. Oscar statuette: © 2009 Academy of Motion Picture Arts and Sciences. When Malcolm X (El Hajj Malik El-Shabazz) was shot to death at 3:10 p.m., on Sunday, Feb. 21, 1965 at the Audubon Ballroom in New York City, it ended a part of the civil rights movement that the civil rights movement never fully embraced. This 44th anniversary of his assassination occurs with America in the midst of societal transition he would have no doubt relished — a transition resulting in great measure from his critical assessment of America and its various racial dishonesties, an assessment that helped lay the groundwork for vast social and political change. In the years of his ascendancy as a harsh, incisive and necessary critic of the nation of his birth, Malcolm X spoke truth to power with a volcanic directness and urbane wit that fascinated and frightened white Americans. But it was his adoption of Islam in a Christian nation that more or less isolated him from the mainstream visibility and acceptance enjoyed by Rev. Dr. Martin Luther King Jr.
Malcolm has always been held at a figurative arm’s length both by the media and by the national historical record; both tend even now to fixate on King and the more familiar (and palatable) narrative of the civil rights movement’s origins in the Christian church. Today, more than two generations after his death, a philosophical dichotomy between King and Malcolm X has been erected and enforced, a schism that, in fact, may not ever have existed. Malcolm X’s place in the leadership of the civil rights movement as taught in schools and universities has certainly been more peripheral, if not downright marginal. You got the overview on King (however abbreviated it might be) in your American history class. You had to go to a black studies class to find out about Malcolm. That simplistic, convenient division has been a persistent fiction in the national life; Malcolm X and Martin Luther King were taking different avenues to the same objective. 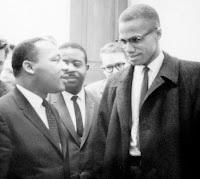 Considering that both men had essentially the same goal in mind — social and economic empowerment of Americans of African descent — considering that both men found more common ground as the Jim Crow agonies of the 1960’s continued — the time is past to weave Malcolm more fully into the fabric of the historical narrative on civil rights. Where he’s always belonged. Where he’s always been anyway. The contrasts between the two men — one steeped in the body of the church, the other seared in the crucible of the street — embodied the duality of black Americans’ lives. Both men were riveting public speakers, of course, but Malcolm’s earliest addresses sharply, sometimes harshly made plain the stakes: nothing less than equal, whatever it takes. Period. King was expressing much the same message from the loftier rhetorical precincts of the Baptist church, but his reverential homiletics had a resonance to a Christian nation that Malcolm, before his conversion to Islam and certainly after, could never hope to attain. What’s been largely omitted from the histories of the civil rights movement is the commonalities that developed between the two men. Dodson told me, for example, that, well before the end, “Malcolm had shifted into a broader humanistic perspective, upgrading the position of black, Hispanic and native Americans.” King had begun to widen the scope of his message to include a full-throated opposition to the Vietnam War. And what’s likely to be seen in the next episodes of the improvisation we call America — the history still to be written — is a matter of faith: the role of Islam in the United States, a nation still psychically scarred by the Sept. 11 terrorist attacks, a country never quite far away from the stealth xenophobia that informs its past. Malcolm X has been gone for 44 years. 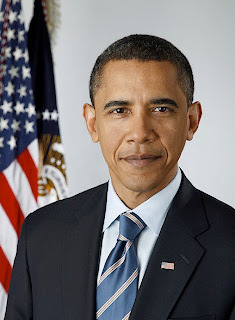 In that time, the varying expressions of the civil rights movement have transformed this nation at every level, ultimately making possible the new man of the moment, Barack Obama, the 44th president. We begin to listen to a voice from the past, one we often marginalized or ignored; we start to prepare for a future, one that’s coming to meet us whether we like it or not. Malcolm top: The Official Web Site of Malcolm X. Martin and Malcolm, 1964: Public domain. Maybe Pennsylvania Sen. Arlen Specter was really bonding with the president on Super Bowl Day, when some of his constituents — the Pittsburgh Steelers — won the game. Maybe Barack got Maine Sen. Olympia Snowe’s martini just right. Who knows? What’s not up for debate, not anymore, is the status of the American Recovery and Reinvestment Act, a 1,071-page behemoth shorthanded as the stimulus bill, a piece of legislation that went from a proposal to a law today, as the first and only slightly mitigated triumph of the administration of President Barack Obama. With the signing of the $787 billion stimulus package, President Obama fulfills a longtime campaign pledge and taken the first steps, baby though they might be, toward righting the badly listing ship of the American economy. If the New York Times’ breakdown of where the money goes is accurate, the stimulus will attempt to spread relief wide across a number of areas, if not that deep: $282 billion in tax cuts (satisfying the Republicans), $100 billion in public works projects, $87.1 billion in state Medicaid assistance, $69.2 billion for education and job training, $50 billion for transportation projects, $35.8 billion in enhanced unemployment benefits, $25.1 billion in COBRA health care coverage for the unemployed, $21 billion in food assistance, and $17.2 billion for upgrades in health information technology. The Republican right held fast, almost uniformly resisting approval of the bill, with only relative moderates Specter, Snowe and Sen. Susan Collins of Maine voting to support the package, breaking ranks with the Republican leadership. The GOP party line was more or less consistent mantra: a bill of this size should more properly go for tax cuts for businesses. If you wanted any sense of bipartisanship, you had to look beyond the Republican leaders and seek out some Republican governors; Charlie Crist of Florida and Arnold Schwarzenegger of California have signed on to the thrust of the stimulus bill. The GOP brain trust would have none of it. On Friday, Senate Republican Leader Mitch McConnell said on the Senate floor that “the stimulus bill that was supposed to be timely, targeted and temporary is none of the above. And this means Congress is about to approve a stimulus that's unlikely to have much stimulative effect." It all seems like, among other things, an ironically sad estimation of the worth of the American dollar in its own right. The idea that $787 billion injected into various sectors of the state and consumer economies wouldn’t have a beneficial impact on them is a rhetorical devaluation of the currency: If three quarters of a trillion dollars can’t defibrillate an ailing economy, what the hell can? But just as important as the effect of the literal application of the stimulus law, whatever that effect might be, is the psychological effect — not just market psychology, but Main Street’s mindset as well. For the first time in too long, people see something substantive happening about the economy, a corrective effort on the same scale as that which needs correcting. People see someone making the effort to change things. How it all plays out is still to be seen, but President Obama and his advisers will reap the benefits of the immediate public perception as men and women of action, urgent, principled and absolutely determined to fix the disaster they inherited from the loyal opposition. The GOP, still very much in wilderness mode, has strategized itself into another dilemma of its identification with the public. Throughout the long process of the stim bill’s passage through Congress, and solidly along party lines, the GOP leadership and wannabes have so solidly positioned itself against the bill’s passage that their opposition has looked like opposition for its own sake — not objections based on economic principle so much as objections animated by plain old political obstinance. The Republicans may be boxed in now by a perception of being the worst kind of opportunistic obstructionist: opposing the stimulus bill (and the broad economic recovery that would at least have a chance of beginning, and without which things would certainly get worse) out of a nakedly partisan fear that it will succeed. Far-fetched? Remember the fighting words of Republican voice box and former recreational pharmaceutical enthusiast Rush Limbaugh (“I hope he fails!”). With the bill’s signing into law, the Republicans are faced not only with a defeat on the legislative merits, but also a loss in the court of public opinion. Maybe the most important thing about the stimulus package signed into is what hasn’t been said yet about how much more will be necessary to do what the stimulus package intends. Remember what the man said? : “Nor does it constitute all of what we’re going to have to do to turn our economy around.” What took place in Denver today might well be considered Stimulus I, the first round of timed-release economic rescue. Hip & knee replacement? Open heart surgery? Chemotherapy? Insert your medical metaphor here. Interviewed Monday by Keith Olbermann on MSNBC, Nobel Prize-winning economist and New York Times columnist Paul Krugman expressed what he thinks is needed: More of the same. So … to the number of big jobs Barack Obama has been and will be asked to do, you can add one more: Butcher. The president has made a good beginning, and given the economic farrago that greeted him on day one of his presidency, a very good beginning, achieved, no less on day 28. The phrase "hit the ground running" doesn't apply if you don't hit the ground at all. We’ll overlook the little Churchillian reference in his speech (“today does mark the beginning of the end”); we know he’s a better orator than that. We’re looking forward to the appearance of his other gifts — as an administrator, a wonk, a visionary, a listener and a leader — as he steers us to our finest hour. At least one finer than now. Today, the first President’s Day of the Obama administration, the patriotism of the holiday reveals to black Americans both its blessings and its barbs. This dramatic leveling of the playing field of American possibility is still sinking in, for all of us. Even as new behavioral models are being road-tested, old habits die hard. Wiltz’s generally upbeat assessment mirrors that of many black Americans, who undoubtedly felt this President’s Day that they really had something to celebrate, that they had more of a vested interest in the outcome of the improvisation collectively known as America. For blacks and minorities, there was finally a reason to salute the subjects of the holiday, beyond the obligatory public genuflections. For the first time in two-hundred-too-many years, black folks had skin in the game. Some of the loyal shoppers at the Peterson Air Force Base commissary in Colorado Springs, Colo., didn’t get the message. It was there this week when the picture of the President of the United States was removed from a Presidents Day sign after customers complained. The base is the home of the North American Aerospace Defense Command (NORAD). The Defense Commissary Agency, which runs the stores, says employees took down the image, which was accompanied by a sign listing store hours, after customers complained that the holiday is about Presidents Washington and Lincoln. A cashier at the commissary who requested anonymity told The Associated Press that pictures of recent past presidents, including Bush #43 and Bill Clinton, have accompanied the Presidents Day closure sign. The cashier told the AP that one customer, a military retiree, objected specifically because of Obama's race. “He said they’re not going to have no black man on the window where he shops," the cashier said. They must be crazy for powdered wigs in that part of Colorado. Two sides of the same American coin, two halves of the same day experienced by the same people. And that duality makes perfect sense given human nature and the propensity for sudden change. It’d be silly to think that, all at once, President’s Day would suddenly resonate for black Americans the way it has for white Americans for generations. Cynicism, that narcotic of expectation based on past experience, takes time to wean yourself off of. And shoppers at an American military base prove there’s always a drug dealer somewhere. You don’t get clear of that drug overnight. Recovery is a process. There’ll be setbacks; you’ll fall off the wagon sometimes. But there’s no going backward, for you or this nation. Not now. Not this time. Those 44 portraits on the presidential wall belong to you, too. They’re part of the museum, the laboratory, the boxing ring, the chapel and synagogue and mosque of this nation, and they’re yours, too. And the 44th picture, the one they couldn’t deal at Peterson Air Force Base, is the one that confirms the promise symbolized by the other 43. This is something different. A first. A shift. The great novelist and essayist John Edgar Wideman once observed that basketball, as best and most faithfully practiced, is an act of athletic levitation, a game performed in the air. When he wrote this, in an essay published in Esquire years ago, he was speaking of basketball, the literal, actual game. Perhaps he couldn’t have seen the dance and bruise and flight of the game in a political context. And he couldn’t have seen you coming, Barack Obama. No one did. We’ve lived and breathed with you all through this brilliant career. You went from playing on the courts at the projects to slinging the rock with the pros at breathtaking speed. Primary after primary, you drained it from the top of the key or took it to the hole like nobody’s business. And against all odds, you won the championship. And you did it, you played the game in the air, on your terms. You’ve been making history from day one. And it’s time to make some more. There is a quietly building chorus of Democratic leadership in Congress — less than a consensus but more than a few — calling for an investigation into the panorama of illegalities by the Bush administration, from warrantless wiretapping of American citizens to hiring and dismissal of Justice Department attorneys for brazenly political reasons, to a policy of torture of foreign nationals on the pretext of national security in the post-9/11 world. Sen. Patrick Leahy of Vermont, the chairman of the Senate Judiciary Committee, has gone so far as to propose a commission with subpoena powers and the ability to grant immunity, levers by which to prosecute the suspected evildoers of the Bush White House and their enablers for what many are calling War Crimes. He’d have been fine if he stopped there. But then this little … qualifier messed up everything. Not so subtly built into that full-steam-ahead call to action is an implied desire to Close the Door on this Sordid Chapter in American Life. Moving forward, eh? The president had already said basically the same thing on Jan. 11, on ABC's "This Week." Vice President Joe Biden said almost exactly the same thing in January, too. And check out the president's words on Monday: “take a look at.” Obama, as gifted an orator as we’ve had in generations, knows the power of words. There’s a cursory, incidental aspect to taking a look at something, and the president knows it. He also knows, or strongly suspects, that to engage in a seemingly partisan inquiry into the misdeeds of his predecessor could derail the sense of national unity he’s trying to enlist in pursuit of urgent business, and short-circuit his own domestic agenda. Those in the Democratic leadership — Rep. John Conyers, House Speaker Nancy Pelosi, Senators Barbara Boxer and Russ Feingold — have been taking up positions in support of independent inquiries into the Bush White House, in spite of how politically inconvenient it might be for the president. Those in the rank & file, ordinary citizens, have let their feelings be known by the millions on the Change.gov Web site, millions of people who said in early January that addressing this matter was of top importance, even more important than some aspects of the evolving economic crisis. This is where you expect to read something about the Chinese ideogram that doubles for “crisis” and “opportunity,” and with good reason: For the Obama administration, in this crisis (not of their own making) there is real potential for change. It’s a rare thing when an administration can, in the literal dawn of its powers, take actions of principle that reinforce, starkly and clearly, the principles this nation was founded on. Opportunities are rarely as distilled, as unambiguous, as this. This is a door President Obama must step through. This — the power of a return to the rule of law — is what he campaigned on, what swayed this nation to elect him. Now, there’s no turning back. If you're serious about walking it like you talk it, this is as good as it gets. It’s on you, Mr. President. Sir. B. You’ve made great strides in nothing flat, but the fact that the need for this kind of investigation is something you’re only considering, only “taking a look at,” is exactly the problem. You’re concerned about reanimating the red state/blue state division you campaigned to overcome. You’ve got unspoken fears of galvanizing the hard Republican right. Don’t worry about them. Rest assured that nothing — nothing — will galvanize your base more than your insistence on following the rule of law that you confessed when you pursued the job you now hold. It’s on you, sir. This will not wait. There’s no backburner back enough to put this on. This should be one of those non-dilemma dilemmas for a president whose indelible sense of right and wrong resonated throughout the campaign just ended. There’s every reason to believe (to hope?) that the decision to follow where evidence leads into whether laws and treaties were violated by the Bush White House is one you’ve already made. The world will long note and remember what you say and do here, or fail to say and do. Count on it. It will stay with you, for good or ill, for the rest of your life. It’s on you, Barack. You got the ball. People in the stands are crazy on your side. No debates, no chin-pulling and no passing it off to someone else. You got the ball. You have to take the shot. Image credit: Basketball: Reisio (public domain). Obama jumper: MCC Eric A. Clement, USN (public domain). It’s been tough for Team Obama to get rid of all the dead wood and termites around the White House. The transition went well enough; there were no reports of pranks by the previous occupants; nobody made off with the O keys from the computers. Still, some things the exterminators can’t do anything about. There are apparently some longtime employees at the Pentagon and other agencies, Bushies who for one reason or another can’t be dislodged right now. And one of the most troublesome holdovers from the Bush administration is one of those we encounter every day. Newsweek reports that the Obama administration is hard at work looking for an alternative to the phrase “war on terror,” the monstrously hubristic sobriquet foisted on the American people, and the American media, to describe the two-theater war against terrorism and religious extremism — certainly in Afghanistan, more nominally in Iraq. Strict linguistic constructionists will say it’s no better than “war on terror.” Not so. “War on terror” speaks to an unwinnable conflict. The United States, its coalition partners and proxies and the world at large have no hope of winning a war against terror any more than they could hope to win a war against rage, a war against sadness, a war against cheerfulness or a war against any other transient emotional state. A “war against terrorism,” however, is another matter entirely. That phrase, however imprecise, attempts to more accurately explain the parameters of the conflict, articulates the objective in more militarily definable terms, rather than the breathless catch-all employed as boilerplate by the Bush administration for years. During the Cold War that followed, the United States was said to be locked in a battle “against Communism.” Historically, it’s been very possible to wage war, hot or cold, against an ideology in general as well as that ideology’s practitioners in particular. We’ve got to come up with something, Team Obama says. And our best, most reliable international ally agrees. The more we lump terrorist groups together and draw the battle lines as a simple binary struggle between moderates and extremists, or good and evil, the more we play into the hands of those seeking to unify groups with little in common. Terrorist groups need to be tackled at root, interdicting flows of weapons and finance, exposing the shallowness of their claims, channeling their followers into democratic politics. The “war on terror” also implied that the correct response was primarily military. But as General Petraeus said to me and others in Iraq, the coalition there could not kill its way out of the problems of insurgency and civil strife. To disagree slightly: While Miliband is right in warning against lumping terrorist groups together, it’s also necessary to recognize the commonality of technique that can be strategically characterized as terrorism. Whether through targeted assassinations or panic and carnage on a vast scale, these techniques have defined the actions of groups preceding al-Qaida, and have hardly been specific to the Middle East. Its adherents, from the Red Brigades to the Baader-Meinhof gang, from the ETA Basque separatist movement to the Irish Republican Army, have done their grim business in a way that deserves to be described as the deadly collective work that it is. But Miliband is right in understanding how information and prosperity and the principles of democracy are the best weapons against terrorism. Outreach removes the sense of estrangement terrorism needs to survive. And aside from reasserting the British view on the world stage, Miliband is also a world leader, one of many for sure, who’s ready for the United States to start that outreach, to lead again. Changing the name of the greatest wedge between the United States and the world is a good beginning. Maybe the Obama White House will put it on the Web site, open the question to the American people — to anyone: How shall we rename the conflict once known as the War on Terror? The servers will crash from the sudden traffic from hundreds of thousands of ideas. Call it a war on terror, a war on terrorism, call it a ham sandwich — it needs another, final name; it requires the Occam’s razor that Obama made a campaign pledge: The best thing to call this tragic, needless, elective war is Over. Image credit: U.S. forces in Afghanistan: Public domain. Poster: John Falter (year unknown), U.S. Government Printing Office. David Miliband: Alan.heckman, republished under GNU Free Documentation License v. 1.2. Red Army Faction logo: Ratatosk (Public domain). It was the kind of cowboy braggadocio the GOP needs; by its very confrontational nature, it was the kind of calling out that screams Hubris, and a comeuppance to come. That comeuppance got here quickly. 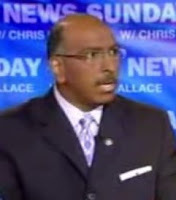 The speed of Steele’s climb to power in the Republican Party and the speed at which the brilliance of his political optics has dimmed may have made Michael Steele the wounded leader of the grassroots organizational arm of an already wounded party. By any reasonable yardstick, Steele did not have a good day on Sunday, when he appeared on ABC’s “This Week” program with George Stephanopoulos. The game, telegenic Steele tried to make the most of a bad situation. But then he made a bad situation worse, in a series of statements that only revealed the disconnect between the Republican Party and the nation it no longer leads. The Washington Post published a story on Saturday investigating allegations that Steele had made a payment of more than $37,000 to a defunct company once run by his sister for work on his 2006 Senate campaign — work that was apparently never performed. A followup story was published in The Post on Monday. The Post reported that records from Steele’s 2006 Senate campaign showed that $37,262 was paid to Brown Sugar Unlimited for catering and Internet services. The payment came 11 months after Monica Turner, a pediatrician who lives in Potomac, Md., had legally dissolved the company. In recent days, federal agents have contacted Monica Turner, a spokesman for the chairman told The Post. Steele said those contacts were for "purposes of closing out" the matter. He said he will be “proactive” in gathering information to give to the FBI. Steele went so far as to independently characterize for Stephanopoulos the status of the FBI’s investigation, saying that the agency was "winding this thing down." Despite Steele’s forthrightly-delivered explanation, there’s a whiff of the Blagojevichian around this whole thing matter. This is not the way I intend to run the RNC, with this over my head. We're going to dispense with it immediately, he said as though it were a stray thread on his suit that required deft removal, as though it was anything but a federal inquiry potentially damaging to him and the fundraising and operational organization he now directs. That was bad enough. More troubling — or certainly more embarrassing from a populist standpoint — were the statements he made later Sunday on the ABC program. Stephanopoulos and Steele discussed the current economic crisis and the various means now being considered in Congress to put Americans back to work. After a video cutaway to an interview with Florida Gov. Charlie Crist, in which the governor endorsed some of the fundamental aspects of the Obama recovery plan, including public sector employment, Steele expressed disagreement, essentially saying that government jobs aren’t really jobs, and that job losses in the private sector are never a permanent thing. STEELE: You've got to look at what's going to create sustainable jobs. What this administration is talking about is making work. It is creating work. STEPHANOPOULOS: But that's a job. STEPHANOPOULOS: So a job doesn't count if it's a government job? STEELE: Hold on. No, let me, let me, let me finish. That is a contract. It ends at a certain point, George. You know that. These road projects that we're talking about have an end point. STEPHANOPOULOS: I guess I don't really understand that distinction. STEELE: Well, the difference, the distinction is this: If a government — if you've got a government contract that is a fixed period of time, it goes away. The work may go away. That's — there's no guarantee that that — that there's going to be more work when you're done in that job. STEPHANOPOULOS: Yes, but we've seen millions and millions of jobs going away in the private sector just in the last year. STEELE: But they come — yes, they — and they come back, though, George. That's the point. When they go -- they've gone away before, and they come back. Millions of Americans will now be surprised to discover that the jobs they have aren’t really jobs at all. Millions of other Americans will be relieved to find out that the jobs they’ve lost since the recession started in December 2007 will come back, like carrier pigeons or dogs who mysteriously find their way home from a thousand miles away. Just be patient. They’ll come back. The sun'll come out tomorrow. It’s not the kind of thinking that’s likely to endear the American people to the GOP; there’s an elitism in the marrow of Steele’s statements that can’t be ignored, a sense of being out of touch that’s symbolic of the current Republican malaise. This disconnect is largely why the GOP lost in November. Of all the steps in the healing process the Republicans must undertake to regain political credibility, this may be the most important: resonating with everyday people again. For all his media prowess and full-throated support for Republican values, the Man of Steele has his hands full not just rebuilding a party but also rebuilding that party's image — and now, not just its image but his own as well. Image credit: Steele: Still from Fox News Sunday, Feb. 1. Well, dayum, that was fast. Apparently the idea of politics in action, the spirit of getting things done doesn’t stop with the brain trust of those in the Obama White House. Politico’s Ben Smith, writing in his blog, reported that many on the RNC payroll, including members of the committee’s communications staff, have been warned that their last day is Feb. 15. So much for two weeks’ notice. Greer told The Hill that more staff reductions may be coming. “Although there are some that are told today, there may be some that are told tomorrow and some that won't be told at all,” he said. In some respects this is nothing new. It’s a brutal but unavoidable law of life in government and in business: A change at the top invariably means that change trickles down throughout the organization. What makes this turnover so unusual is the way it’s happening at the operational arm of a political party already in the midst of its own turmoil of identity. When you’ve got a party that doesn’t really know what it is right now, it can’t be existentially reassuring when the group that handles that party’s day-to-day operations is suddenly subject to, uh, change. And for many loyal Republicans, there must be some concern that Steele, the committee’s first African American leader, already represents a tectonic shift in GOP symbolism. Now they’re faced with new uncertainty as Chairman Steele’s broom sweeps clean. The adventures of Michael Steele are just beginning; where this leads is anyone’s guess. But some in the blogosphere are amused. 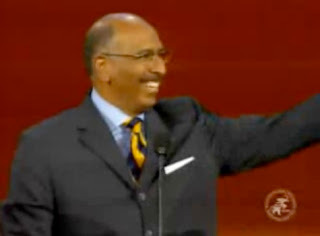 Image credit: Steele at Republican National Convention: RNC. It’s one of those records that’s been around for so long, been so thoroughly a part of the furniture of our culture and our lives, it seems like it’s always been there, like the air we breathe or the sunrise we take for granted, a sound that captures everything, the full range of our emotions, without a word being spoken. ‘Kind of Blue,’ Miles Davis’ lapidary classic of jazz, celebrates its 50th anniversary this year as something kind of immortal, one of those records that's managed the rare and difficult dance of being a part of its time and our time — whenever “our time” might be. In its five tracks, some of the most accomplished talents of the jazz world set down music — spare but animated, lean but muscular — that’s a celebration of serendipity, of kismet, of the straight-up good luck that happens when everything just falls together. That seemed to happen a lot for music in 1959. Motown was launched early that year; less than six months later the year welcomed the Grammy Awards, the recording industry’s salute to the industry’s best (according to the industry). Charles Mingus’ signature record “Mingus Ah Um” was released, combining the mercurial bassist’s post-bop sensibilities, lush Ellingtonian band arrangements and a feel for the urban drive that animated the nation in another landmark recording. But Miles was really feeling it that year. When Davis gathered with his sidemen at Columbia Records’ 30th Street Studio on March 2, 1959, he was riding high on the creative wave that had already led to “Miles Ahead,” its own classic, the year before; the same wave that would lead to “Sketches of Spain” at the end of a crowded ’59. He’d worked with most of these musicians before, but what resulted on “Kind of Blue” was an ironic combination of a freshness borne of familiarity, the happiest of accidents. Listen to the opening track, “So What,” the opening 10-note sequence as recognizable as anything in jazz. As the group coalesces around the melody, Davis pulls back on the throttle … and we’re cleared for takeoff, soaring on a beat and melody that thrives on economy rather than flash, an understated virtuosity. It’s counter-intuitive to think of a full emotional palette being possible on as few as five songs, but “Kind of Blue” displays a range of emotions with a depth and richness of spirit that not many recordings have approached since. The humor of “Freddie Freeloader” (with Kelly on piano) gives way to the introspective “Blue in Green,” with Miles in fine form as a soloist, questioning and plaintive. “All Blues,” an 11-minute classic within a classic, finds the group in a balanced, upbeat groove with Adderley and Coltrane playing some of their most inspired solos. And on “Flamenco Sketches,” the power, the majesty of this group becomes truly evident in a quietly confident sound whose components fit together like the parts of a fine Swiss watch. All fine art outlives its creators. We hear this music from 50 winters ago; once the work of ordinary men, now it’s mostly the work of ghosts just above our heads. Jimmy Cobb, the drummer on every track of the album, is the leader of the So What Band, currently observing the record's golden anniversary. He’s the last surviving member of the sextet that changed jazz, and music, forever. Coltrane left us in 1967. Chambers died in 1969; Kelly in 1971, Adderly passed in 1975, Evans exited in 1980, and Miles himself died in California in the fall of 1991. In the intervening years we’ve been witness to rock music’s pre-eminence in the culture, the insurgency of rap and hip-hop, and any number of other musical styles that flash on the scene for a hot minute and then vanish. But “Kind of Blue” endures, a modal, bluesy sequoia of jazz from a departed soul of music and his comrades in melody, an indelible gift to keep life thoughtful, rueful, soulful, joyful for those of us still on this side of the stars. 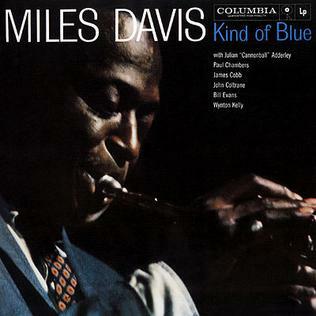 Image credit: Kind of Blue cover: © Columbia Records. So What notes: republished under GNU Free Documentation License v 1.2. 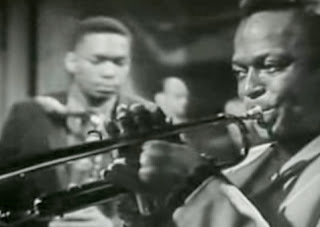 'Trane and Miles: Still image from taping on April 2, 1959, CBS Studios New York City, recorded by Robert Herridge. It was the kind of media blitz that the best politicians tend to perform when they’re on offense, promoting new legislation or advancing a new policy by carpet-bombing the network anchors with one-on-one interviews. It’s seizure of the high ground, and it often works. So it was a little unsettling today when President Obama made the rounds of major broadcast and cable networks not as evangelist but as apologizer-in-chief, publicly admitting the latest, and unsettling, mistake in the vetting process for one of the nominees for his Cabinet. Unsettling, but just a little. Tom Daschle, the former South Dakota senator and Senate Majority Leader, and the president’s choice to head Health & Human Services, took himself out of the running for the position after disclosures of tax improprieties: specifically, not having declared $140,000 of actual or imputed income on his returns. Daschle overlooked paying taxes on income for consulting work and personal use of a car and driver, and improperly deducted charitable contributions. He paid more than $128,000 in back taxes and almost $12,000 in interest last month. The Daschle disclosure was just the latest in a series of missteps by the usually sure-footed Team Obama. The first occurred over former New Mexico Gov. Bill Richardson, Obama’s first choice to head the Commerce Department. Richardson exited amid a grand jury investigation into a state contract awarded to his political donors. Timothy Geithner, tapped to be Treasury Secretary, was also found to be delinquent in paying $34,000 in back taxes, but was confirmed anyway in January. Nancy Killefer, Obama’s pick for the new position of chief performance officer, withdrew the same day as Daschle, also over tax matters related to domestic help. This cascade of embarrassments is the kind of thing that would have deeply, visibly disturbed a man of a lesser inner balance. Rather than retreat to official White House statements or weak explanations by the White House press secretary, Obama manned up. “I think nobody was better equipped to deal both with the substance and policy of health care. [Daschle] understands it as well as anybody, but also the politics, which is going to be required to actually get it done,” Obama told CNN’s Anderson Cooper on Wednesday. “I screwed up,” the president of the United States said. Obama made similar statements when talking to CBS’ Katie Couric, NBC’s Brian Williams, and to Fox News. “I’ve got to own up to my mistake. Ultimately, it's important for this administration to send a message that there aren't two sets of rules — you know, one for prominent people and one for ordinary folks who have to pay their taxes,” Obama said on NBC’s Nightly News. “I'm frustrated with myself, with our team. ... I'm here on television saying I screwed up,” Obama said. There’s a thin line between the forthright and the meretricious; an apology is one of those things that have the potential to get weaker every time it’s expressed. The cynics will say multiple displays of contrition by the president project a sense of weakness. For them, apparently, being president means never having to say you’re sorry. Give President Obama credit for understanding how a rapid, candid response to a situation gives you a measure of control over the situation. In every interview Obama brandished his imperturbable cool, coming across finally as someone genuinely caught off guard by this latest revelation and determined not to let it happen again. End of story, or pretty damn close. You could see it in the faces of some of the journalists who interviewed him: a sense of “We’re not quite sure how to take this, this degree of candor in a president.” You can hardly blame them, they haven’t had much practice recently. The nation had nothing like this honesty when dealing with the sclerotic prevaricators of the Bush administration. For the past eight years we experienced an administration bent on control of not just the message but also the language the message came wrapped in. The country lived through a president who studiously evaded admitting he was ever wrong about anything. So the full-throated mea culpas of President Obama on what are, when all’s said and done, errors in professional judgment are something we can live with. It’s refreshing to find a president honest enough about himself to admit having been wrong about someone who may not have been honest with him. Change we can believe in begins with a president we can believe.